ThE)Android on the Magazine"Giochi per il Mio Computer"
A nifty Ogame tool for calculating FleetSave, so far available in italian only, has been translated by me, so now the english version is available also, you can grab it here: Download Link. Yes. It's official our 'National Android' ranked FOURTH at the World Cyber Games for Warhammer 40k Dawn of War, after easily passing the Group D and defeating the powerful german Left he loses to Select and win a 4th spot on the World Tournment. Way to go Andy! Next year we want you first! 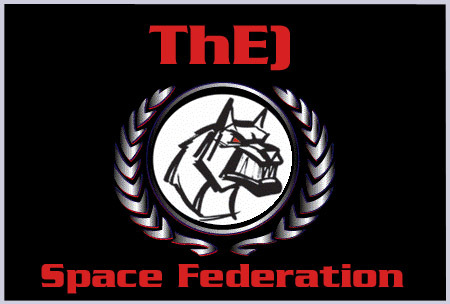 Today we at Clan ThE) decided that we wanted to 'PWN PPL' on this simple yet addictive (Very) Real Time Strategy Game, so we created an Alliance on Universe 8 at Ogame.org, we are known as ThE)SpaceFed and this is our Logo. Today Clan ThE) defeated another clan on gamedrome, this time was the turn of red|code a very nice cw, with some trouble at the begginings but at the end everything was fixed and the cw finished 4:1 for us. GG. Gentlemen Start Your Engine, Gamedrome Start Today! "Finally, it has begun, the first season of the DoW Clan League. After a long and exhausting wait, we are set and good to go. SuperCow! has done an unbelievable job to get the code and system specially designed for us, in such a short amount of time, so we all owe him a huge massive thank you before we go anywhere. You can now find the list of rules, fixtures and anything else you need right here on the GameDrome site. " Posted By Lordmarine on Gamedrome. ThE)Showtime has been interviewed by TE|Lordy, admin of the famous Gamedrome Clan League, if you want to read it you can find it in the Articles section. After months of hibernation due to holidays and exams, the new clan site is finally online. We have a great renewal project for the future, involving every single division of the clan but especially focusing on the most revolutionary RTS of the year: "Warhammer 40.000 -Dawn of War". Leaded by Android and Mafia, our dow team is getting better and better, we are back, and "Now is time to prove what we know to be true, that we shall conquer all". Android strikes again! Another first and unquestioned position for one of our great team leaders, today Android won the National WCG qualifications. He managed to reach unbeated the finals, where he won for 2-1 vs one of the most well known RTS italian players since 1997, the mannered and very experienced MyDyingExarch. Congratulations to our Android, that won a free trip to Singapore and the opportunity of defending Italy's honour at WCG grand finals, in the upcoming November 2005. Today in Milan, one of our leaders Android, the best player of our DoW Division, won the National Tournment of ESWC, and a prize of 900 €. A smooth victory, with an outstanding tournament stats of 11 wins and only 2 losses. Way to go Android! ThE)Android has been interviewed by Glory, admin of the famous DowSanctuary about is past, if you want to read it you can find it in the Articles section.